Holy crap, it's really happening! Bring on the Night's official release date is here. Most authors will tell you that on release day, they are so nervous they can't eat or sleep. They often pace the floor endlessly, stopping only to refresh their Amazon page to see if the ranking has gone up or down and if there are any new reviews. I'm not blase about this release--on the contrary, I am immensely grateful. 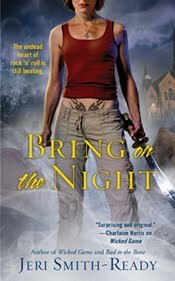 I submitted a synopsis for Bring on the Night and its sequel, Let It Bleed, to my publisher in December 2008. January 1, 2009, I began writing Bring on the Night, not knowing whether it would ever see the light of day, because I knew that if it were bought, the deadline would be imminent. About halfway through, I fell in love with it. Painfully so, because I knew there was a chance it would never be published. By the time the offer came through, the rough draft was 80% complete. Anyway, the book is now in stores, both online and real life. And I am too busy to be nervous, though by all accounts I should be terrified. The sales of Bring on the Night will probably determine whether I sell the fifth and final planned book in the series, Lust for Life. I try not to think about that, because of course publishers make decisions based on more than one single number (I hear that tea leaves and gibbon entrails are also involved), and because it's ultimately out of my control. All I can do is write the best book possible and try to let people know it's available. I can't control the distribution or the number of copies the big bookstore chains order, or whether stores place it face out or on a special rack. Everyone knows those factors are controlled by aliens living in a Gobi desert bunker. More important, I should be nervous because I took risks with this novel. The story demanded it. And maybe it's because the story (and the characters) demanded it that I'm not scared. I made choices for honest reasons, and my editor and critique partners helped me execute those choices in a way that would bring readers along for the ride. Besides, I'm busier than a [okay, I looked up "busier than a" phrases, but they all involved missing limbs, so insert your own joke here, according to your level of sensitivity]. I'm currently buried in line edits for Shift. Which is exactly where I want to be--I loooooove line edits. Line edits are where a good story becomes a great book. Back to Bring on the Night: I did a Skype chat interview with Kayley Thomas as Hopeful Monster blog last Friday (which I really enjoyed--seriously, if you want to do an interview with me in the next couple months, this is the way to go, rather than sending me a list of questions I will spend hours on and maybe return to you in September). Kayley posted the chat and a lovely feature this morning. Go read it if you want to know more about the WVMP series or want to hear her insightful take on it. Oh, and if you want to read my interview. 1. "Swamp Thing," by Chameleons UK. Possibly the best song ever written. If nothing else, perfect for this book. The obvious connection is the title, which is also the name of a zombie movie starring Adrienne Barbeau. But the lyrics touch on several elements of the book, from talk of a storm to "selling blood by the litre" to "nothing's sacred anymore." And you know, a swamp thing. This is one of several songs not actually on the playlist in front of the book. But I found after doing the soundtrack for Shade that playlists were vastly improved by the addition of songs to fill in the gaps where music is not mentioned in the book. I also took care to make sure the songs flow into each other well. This makes a soundtrack more listenable than a simple list of tunes. 2. "Not Dark Yet," by Bob Dylan. Another song added to turn a playlist into a soundtrack. I needed a song to represent a section of the book where Ciara is filled with fear and very tempted to rely on the false comfort of denial. Lyrics. 3. "Ripple" by the Grateful Dead. The only Dead song I truly, truly love (I am not a fan, though I married into a family of Deadheads). I once watched my husband sing it at his cousin's funeral. Everyone cried, but it was a comfort. 4. "Wild Horses," Rolling Stones (covered here by the Sundays). One of my favorite Stones tunes. I adore songs that reflect mature love rather than the initial glow of infatuation. Some people say this is a breakup song, though Mick Jagger denies it. To me, it's about a couple who has been through wrenching heartbreak and mutual hurt, but they see it through to the other side. I chose the Sundays' version partly because this section of the soundtrack needed a bit of a faster tempo than the Stones slow, dreamy original, and also because I wanted it to be from Ciara's perspective, so a female singer matched better. 5. "Seventh Symphony, Second Movement," Ludwig van Beethoven. Yes, classical music on a WVMP soundtrack! Hard to explain this one without spoiling the plot, so I'll just say it's one of my favorite, if not my favorite piece of music ever. I really like this recording I found on playlist.com, because most orchestras play it too fast for my taste. They ignore the "etto" in the "allegretto," you know what I'm sayin'? If you get a chance to pick up Bring on the Night this week, I love you! I hope you enjoy reading it half as much as I enjoyed writing it. Now excuse me while I go find a hundred different synonyms for "sigh." I was meaning to blog about this development this week, anyway, but, being scalp-deep in revisions for Shift (which hey, is now available for Amazon pre-order, by the way, which is incredibly scary because it's still lying broken and busted in thirty-four pieces on my hard drive, waiting for me to reassemble it into something resembling a book), I wasn't sure I'd have time. But then LeBron James went all diva and decided to make his announcement about where he's playing next year (and presumably for many years to come) on a special hour-long ESPN show tonight at 9pm called "The Decision" (brought to you by bing and the University of Phoenix). It was just too pretentious not to imitate. So without further ado, brought to you by orange Tic-Tacs and Tetley British Blend decaffeinated tea, I'd like to announce that I just signed a multimillion dollar contract to write a YA vampire short story for the upcoming PC Cast-edited anthology, Eternal: More Love Stories With Bite, coming to you this December (the Amazon listing of October 26 is incorrect) from BenBella Books. Like LeBron's lust for an NBA Championship, I've always wanted to be in an anthology. I've stood by season after season watching Kobe Bryant my fellow urban fantasy authors publish many stories, often before they'd even published their first novel. It's a great way for a new or newish author to find new readers. I'd had a couple of anthology invitations that I had to turn down due to book deadlines (and the fact that I stand firmly in demand of NBA minimum salary SFWA-level minimum pay rates of $473,604 per year five cents per word). Now I have on my plate not only this story, but one for the Smart Chicks Kick It tour anthology, titled, Highway to Hell, coming September 2011 from HarperCollins. I'm absolutely silly psyched about these opportunities to flesh out the universes I've created in my novels. Because I can't come up with two kinds of vampires with only one brain, my story for Eternal will be loosely tied to the WVMP Radio series. The vampires will have the same rules (stuck in time in the era they were turned, no sunlight whatsoever, the need for human blood, and yes, obsessive-compulsive), but the setting and characters will be completely different. The main character is Ciara Griffin's first cousin once removed, Mary Cassidy O'Riley ("Cassie" for short) a sixteen-year-old member of one of the South Carolina Irish Traveler groups. Ciara's Traveler relatives figure prominently in Book Four, Let it Bleed, which will be out next August. Cassie will also appear in that book, because I'm completely incapable of creating a character without needing to explore their lives in-depth. (This is another reason why I rarely do short stories--I fall in love way too easily.) But the story is by no means required for reading the series, and vice versa. The first Love Stories With Bite collection, Immortal, is already out and includes such phenomenal authors as Rachel Caine, Rachel Vincent, and Richelle Mead. 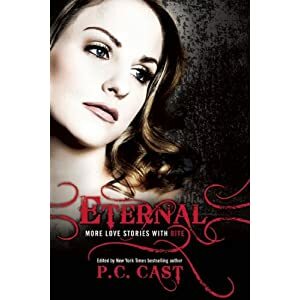 I can't say which authors have been confirmed for Eternal, because it's not really official until all stories are turned in and accepted for publication. So I suppose there's an outside chance LeBron could end up playing for the Minnesota Timberwolves my short story could still be rejected on the grounds of absolute suckage. That would be really awkward, after this big press conference blog post. And with THAT, I better get back to Shift so that I can have plenty of time to polish up the aforementioned short story, which is due next Thursday.